The 62nd annual Clown Town will take place on Friday, May 18, 2018 (6pm to 10pm) and Saturday, May 19, 2018 (10am to 8pm)! Every Spring, thousands of children throughout the Merrimack Valley start asking their parents, “When is Clown Town?” Clown Town takes place in the Park in Andover, at the Corner of Bartlet and Chestnut Streets, on the third weekend of May (Friday night and Saturday with a HEAVY rain date of Sunday). Friday’s hours are 6PM to 10PM and we’ll have rides, carnival games, hair glitter, candy/snacks, and a DJ. Clown Town opens at 10AM on Saturday and along with the rides and carnival games, we’ll have face painting, hair glitter, sand art/crafts, toddler/preschool games, yard sale, slush, candy, coffee and more. 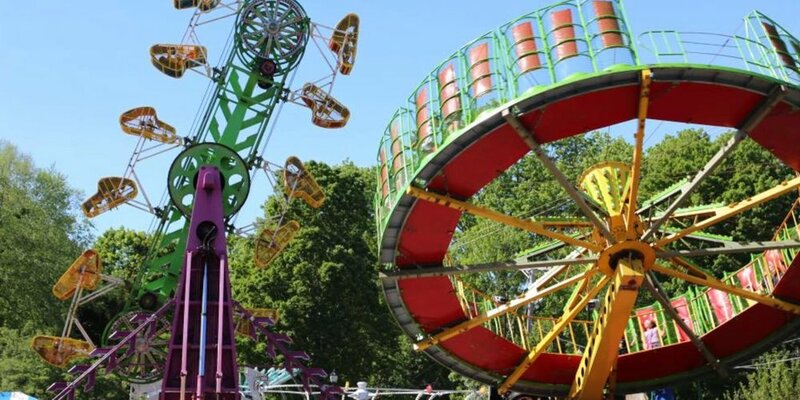 The rides and carnival games will stay open until 8PM on Saturday but everything else will close at 4PM, so come early!Clown Town has been an Andover tradition for over sixty years. What began as a little fair has expanded into a two-day fun-filled event. Whether you’d like to come for an hour, or the whole day, there is something for everyone!Clown Town is Andona’s largest fundraiser of the year. Your support at Clown Town helps us to provide funds for programs for Andover youth. We typically raise $35,000 at Clown Town and all proceeds go back to the children of Andover. There are approximately 15 rides. The majority of which are suitable for smaller children. Tickets will be sold for $1 each. Generally big kid rides require 4-5 tickets and kiddie rides require 3 tickets. Tickets are sold as single tickets or packs of 20, 36 & 60. Games, bungee jump ($7), and food are cash only.